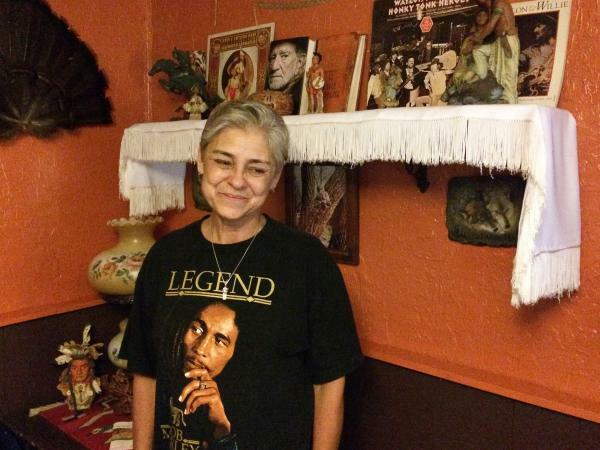 Jymie Jimerson collects Willie Nelson memorabilia in her home in remembrance of her late husband, Steve, who was a fan. In a corner of Jymie Jimerson's house in the town of Sparta, in southwest Missouri, she has set up a kind of shrine. It has Native American art representing her Cherokee heritage alongside Willie Nelson albums, books and photos in remembrance of her late husband. There's a copy of Willie's mid-'70s LP Red Headed Stranger. "When Steve was young, he had red hair and a red beard, so he always really identified with Willie's Red Headed Stranger," Jimerson says. "I try to keep it up there as a reminder of better days." Her husband, Steve Jimerson, was sentenced to life in prison in 1996 for his role in the shooting deaths of two men. Jymie says her husband's life had been ravaged by drug abuse. But after he entered prison, he got off drugs and become a mentor for other inmates. "Once he got inside, recovery became his life," Jymie says. "And that was his passion until the day he died." Steve died on Jan. 6, 2017, of complications from hepatitis C, a liver infection that's especially widespread among prison inmates. He was 59. 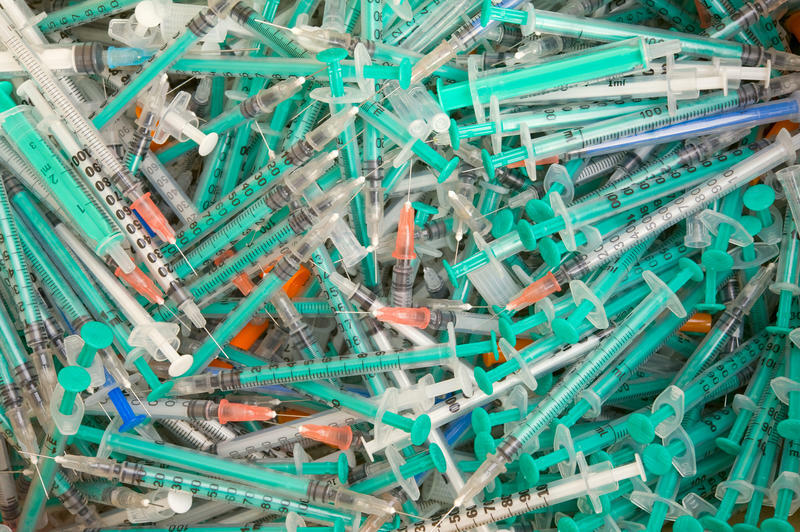 While the disease is common among the incarcerated, treatment with the latest hepatitis drugs isn't. Civil liberties groups in Missouri and at least seven other states are now suing to get more inmates treated with new-generation hepatitis C drugs that are highly effective but also very costly. After Steve Jimerson was diagnosed with hepatitis C while in prison, Jymie says he was on the lookout for news of treatment advances. In 2013, Gilead Sciences introduced Sovaldi, the first of a new generation of drugs called direct-acting antivirals that can cure hepatitis C and with fewer side effects than the previous treatments. But the excitement was dampened by the drug's price. A full course of treatment cost $84,000. In 2016, around 5,000 inmates in Missouri's inmates had hepatitis C, and no more than 14 of them received the drugs, according to internal state data obtained by the MacArthur Justice Center in St. Louis. That's about 15 percent of the 32,000 people incarcerated in Missouri's prisons. Jymie says that her husband wasn't given direct-acting antivirals. By the fall of 2016, Jimerson's health was deteriorating rapidly, and he grew pessimistic about the prospects for a cure. "He told me that if someone had to die to get the DOC [Department of Corrections] to change their policy, he was OK with it being him," Jymie says. As recently as 2012, scores of Missouri inmates were being treated with older hepatitis C drugs, including one called interferon that is notorious for its debilitating side effects. But in 2013, the Federal Bureau of Prisons started changing treatment guidelines to replace the old hepatitis C drugs with new ones. Many states follow those guidelines, including Missouri, according to a spokesperson from Corizon Health, the private company that provides health care for Missouri's inmates. But the updated guidelines gave prisons more leeway to decide when it's appropriate to provide treatment. And as Missouri phased out the old drugs, it hasn't used the new drugs nearly as often. That has left only a handful of inmates getting any hepatitis C drug treatment at all. 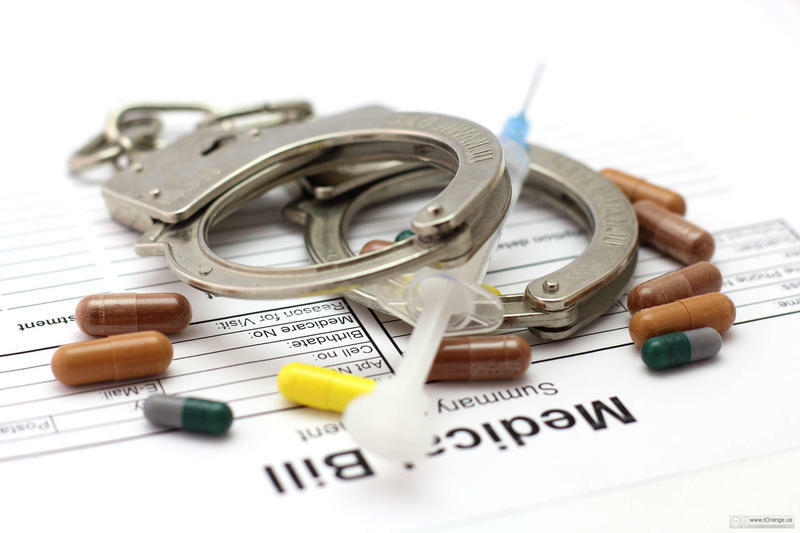 In December of 2016, the American Civil Liberties Union and MacArthur Justice Center sued to get the Missouri Department of Corrections to provide direct-acting antiviral drugs to inmates with hepatitis C who qualify for treatment. ACLU lawyer Tony Rothert says the state's current treatment practices violate the Constitution's Cruel and Unusual Punishments Clause. "The Supreme Court has said that in the context of medical care, that means that prisons cannot be deliberately indifferent to serious medical needs," Rothert says. "Hepatitis C fairly easily satisfies this test, because if left untreated, there's a fair chance that you will die." Advocates making this argument got a big boost for their case in November, 2017, when a federal judge in Florida ordered that state's prisons to start providing direct-acting drugs to its inmates at least until that state's case goes to trial in August. "It was a great victory for people who are incarcerated and have hepatitis C because now we have a federal judge who said, 'Look, this is just unconscionable,' and the state is going to have to do something about it," says Elizabeth Paukstis, public policy director of the National Viral Hepatitis Roundtable. In July, 2017, the Missouri lawsuit took a leap forward when the judge overseeing the case certified it as a class action on behalf of state inmates with hepatitis C. The Missouri Department of Corrections and Corizon, which are defendants in the lawsuit, have appealed that ruling. Both the Missouri Department of Corrections and Corizon declined to comment on the suit or answer questions about their hepatitis C treatment protocols beyond saying they are following federal guidelines. But if Missouri and other states are required to offer the new drugs, they would face a huge problem, says Gregg Gonsalves, an assistant professor of epidemiology at the Yale School of Public Health. "Even if they wanted to treat patients, they would break the bank. They would run out of money to treat every other medical condition," he says. For example, if Missouri gave the 2,500 inmates that the ACLU says are candidates for Harvoni, the acting antiviral drug it now uses, the cost would exceed $236 million, based on its list price. That far exceeds the Department of Corrections' entire budget for inmate health. Gonsalves says the emergence of newer, cheaper drugs could help, and some state prison systems have managed to negotiate discounts. Even at a lower cost, though, providing these drugs on a large scale could still cost states a fortune. But advocates insist it's worth it to stop the disease from spreading. And a 2015 study showed that as many as 12,000 lives would be saved if inmates across the country were screened and treated; preventing liver transplants and liver disease would save money in the long run. "The impetus for treating infectious disease in the prison system is that it's a population you can reach, it's a population you can cure, and it's a population you can help prevent onward infections from," Gonsalves says. Jymie Jimerson understands that many people might be skeptical about providing expensive health care for prison inmates. But she hopes they can see them as more than people convicted of crimes. "I'm not condoning what they did. I'm not condoning criminals," she says. "What I'm saying is, they're human beings. And there are hundreds, hundreds of first-time offenders that this medication would cure them. So that when they went home, they could actually spend time and enjoy a little bit of life with their families." This story is part of a reporting partnership with NPR, KCUR and Kaiser Health News. You can find Smith on Twitter: @AlexSmithKCUR. A new report from the Centers for Disease Control and Prevention (CDC) ranks Indiana among the states with the highest rates of hepatitis C infection, a virus that destroys the liver and leads to liver cancer. Indiana's rate is double the national average with 2 per 100,000 people affected. 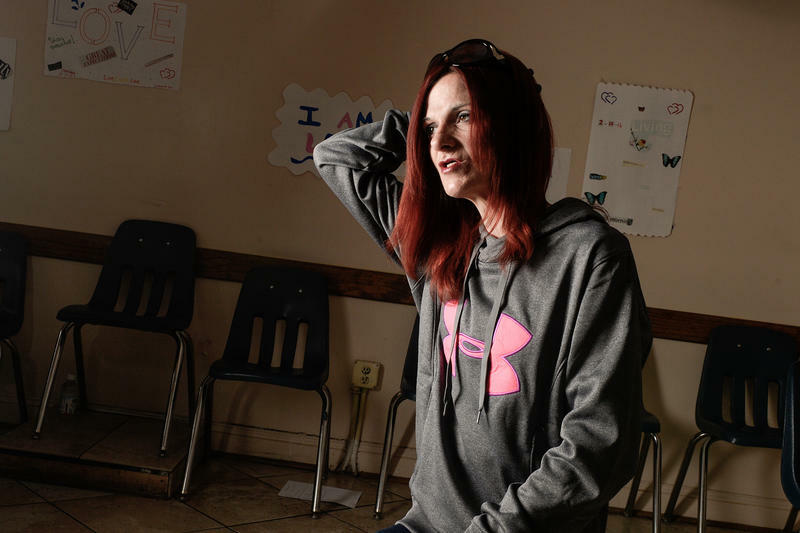 These people recently tested for and were diagnosed with hepatitis C.
"Once the meds start coming out of my system, in the past, it's always caused me to relapse," she said. "I start self-medicating and trying to stop the crazy thoughts in my head." Correctional facilities are responsible for providing health services to people who are jailed, but that doesn’t mean that prisoners don’t face financial charges for care. In most states they may be on the hook for copayments ranging from a few dollars to as much as $100 for medical care, according to a recent study.